Well, let’s familiarize ourselves with a lesson of the past and endeavour to draw the right conclusions. All that is over, under shall show. Happy thou who the riddle readest. The mystery can be reduced to simple dilemmas. When we die does everything end for us, or is there some way that we go on? Is there nothing more to us than the sum of our material parts, or does the soul exist? Is the notion of the soul a figment of human psychology, or perhaps an invention of religion? Or could it be something wonderfully real? Science, which can weigh, measure and assess the corpse of a dead person, is powerless to tell us whether anything spiritual occurs after death… Religion presents the opposite case, equally passionately, on equally flimsy grounds. There is no scientific proof of the existence of the various religious heavens and hells and afterlife realms. Nevertheless, the religious or spiritual point of view strongly asserts that the soul does exist, and will undergo a judgement after death, and can transmigrate through many forms, and can be reborn. Confronted by these two opposite opinions, it is natural for thinking people to consider the universal law of physical death and to wonder what their own fate might be. One such person, according to an Indian sacred text called the Katha Upanishad, was Nachiketas, a brave and inquisitive young man who had found his way to the ‘House of the Dead’ and earned the right to demand a wish of Yama, the Hindu god of death. Yama: Thou indeed, pondering on dear and dearly loved desires, O Nachiketas, hast passed them by. Not this way of wealth hast thou chosen, in which many men sink… The great Beyond gleams not for the child led away by the delusion of possessions… ‘This is the world, there is no other,’ he thinks, and so falls again and again under my dominion… Thou art steadfast in the truth; may a questioner like chee, Nachiketas, come to us. The Aztecs reported that the source of this doctrine of non-violence and cosmic gnosis was a god-king known as Quetzalcoatl – ‘the plumed serpent’ (quetzal means, literally, ‘feathered’ or ‘plumed’, coatl means ‘serpent’). He had ruled, they said, in a remote golden age, having come to Mexico from a far-off land with a group of companions. He had taught, quite specifically, that living things were not to be harmed and that human beings were never to be sacrificed, but only ‘fruits and flowers of the season’. His cult was absorbed with the mysteries of life beyond death and he was said to have made a journey to the underworld and to have returned to tell the tale. 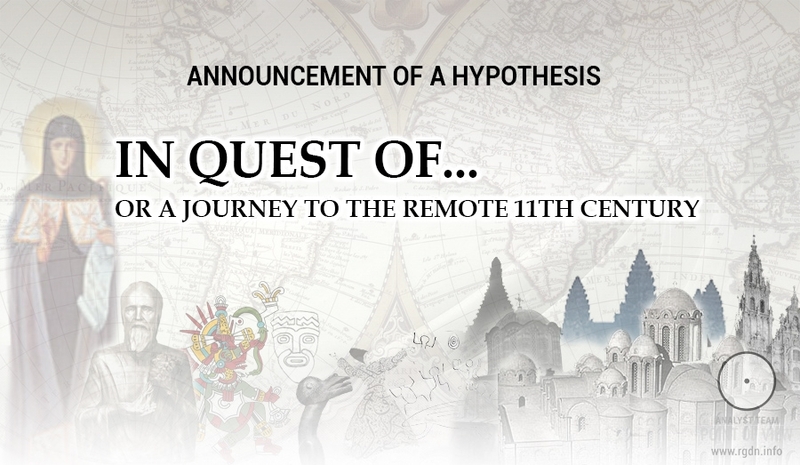 Could there have been a real historical figure behind the Quetzalcoatl story? 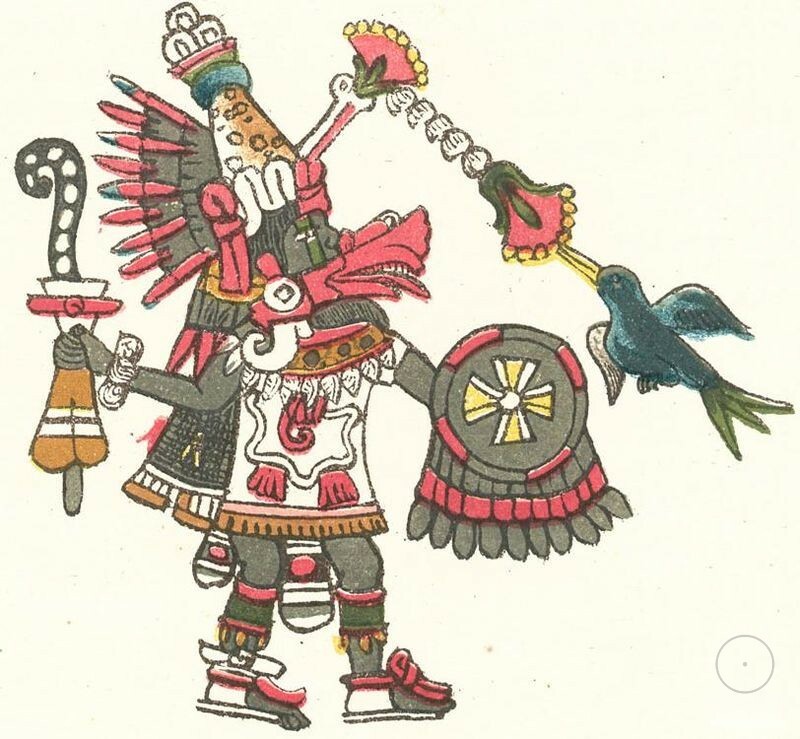 During the two or three hundred years before the Aztecs’ rise to prominence in the thirteenth and fourteenth centuries AD a number of kings, particularly amongst the Toltecs of the Valley of Mexico, are known to have called themselves ‘Quetzalcoatl’. However, they did not claim to be the Quetzalcoatl, but rather to be his successors, and used his name in the manner of a title or honorific. Far earlier than the Toltecs, as we shall see in the next chapter, the distinctive symbolism of Quetzalcoatl was known to the Olmecs of the Gulf of Mexico. 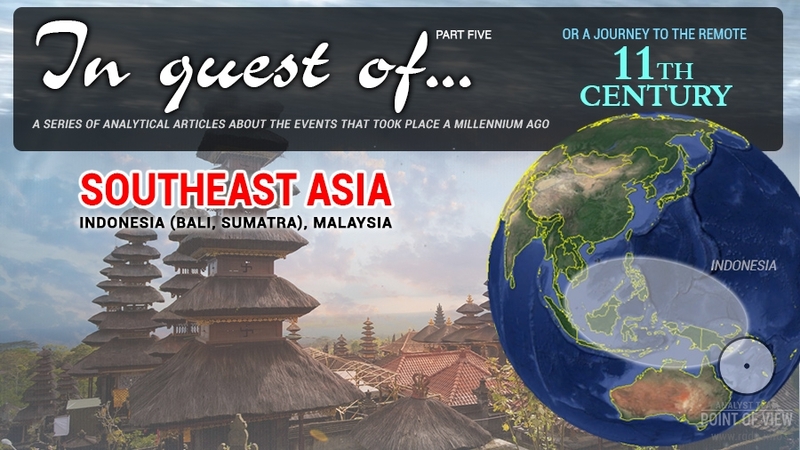 Their culture flourished 3500 years ago. Later, although still more than 2000 years ago, work began at Chohula in central Mexico on a gigantic monument, named in honour of the same god, which continued to be extended and increased in size by all subsequent cultures occupying the site until finally being halted forever by the firestorm of the Conquest. The result of this amazingly sustained project of engineering and sacred architecture is the pyramid-mountain of Quetzalcoatl. Today spiritually ‘capped-off’ by a Roman Catholic chapel, its base area of 18 hectares and height of almost 70 metres make it three times more massive than the Great Pyramid of Egypt. 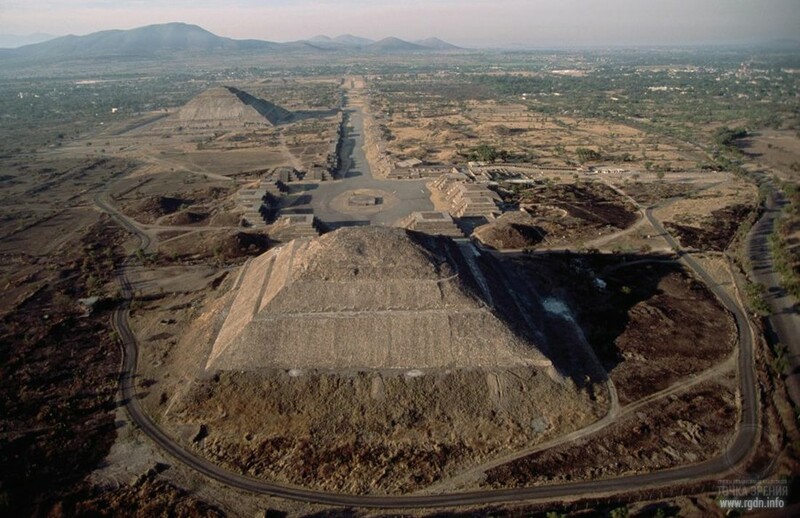 Also around 2000 years ago the mysterious culture of Teotihuacan, 35 kilometres to the north-east of modern Mexico City, was strong in its veneration of Quetzalcoatl, constructing pyramids and other monuments in his honour. 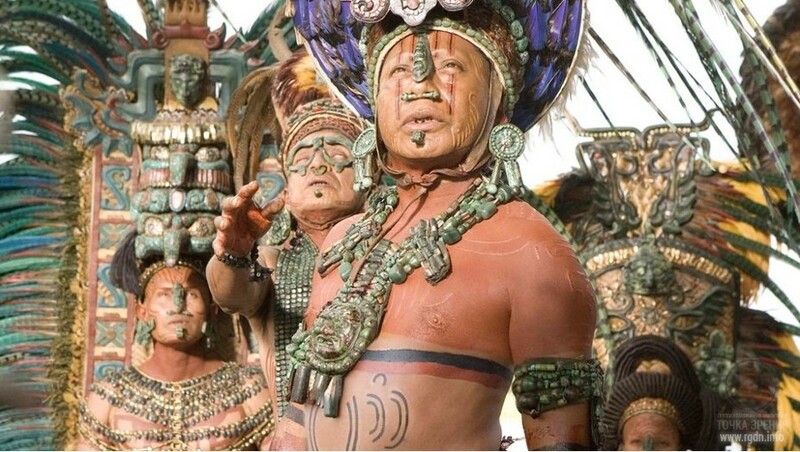 And from at least 1500 years ago until the time of the Conquest, the Maya of the Yucatan, Chiapas and Guatemala worshipped him under the names Kukulkan and Gucumatz (both of which, in different dialects, mean ‘feathered serpent’). Between AD 900 and AD 1200, a nine-tiered pyramid of Quetzalcoatl / Kukulkan was completed at Chichen Itza. Like many of the monuments dedicated to this deity it was constructed on top of an earlier sacred mound that had occupied the same site. They killed a youth of very docile temperament, whom they had kept for the space of a year in pleasurable activities… From among all the captives they chose the noblest men… they took pains that they should be the ablest and best-mannered they could find, and with no bodily blemish. When the priests were questioned by the bemused Spaniards about the reasons for this horrible annual ritual, they are reported to have replied, as though they thought it should have been obvious to all, that the tragic story of the prisoner was ‘the type of human destiny’. 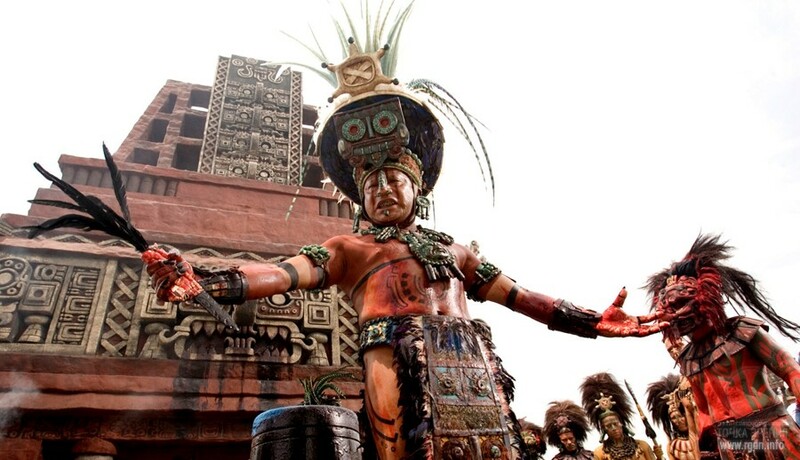 Tlaloc, the god of rain was especially insatiable. To him children, for the most part infants, were offered up. As they were borne along in open litters, dressed in their festal robes, and decked with the fresh blossoms of spring, they moved the hardest heart to pity, though their cries were drowned in the wild chant of the priests, who read in their tears a favourable augury for their petition. These innocent victims were generally brought by the priests of parents who were poor, but who stifled the voice of nature probably less at the suggestions of poverty, than of a wretched superstition. So important was human sacrifice within this monstrous ‘mechanism for breaking men down’ that any member of the public who was reluctant to spectate was ‘held to be despicable, declared unworthy of all public office, and converted into a wretch without the law’. Chiefs and lords, meanwhile, were frequently obliged to witness the sacrifices ‘on pain of being sacrificed themselves if they did not attend’. took and bound [their captives] hands behind, and also their feet; then they threw them over their shoulders, and carried them to the top of the temple, where was a great fire and a great heap of coals; and when they had arrived at the top, they gave them to the fire… and there in the fire the unhappy prisoner began to twist and to retch… and he being in such agony, they brought him out with grappling irons… and placed him on the stone… and opened his breast… and took out the heart and threw it at the feet of the statue of Xiuhtecutli, god of fire. Birth comes, life comes upon earth. the glory of that by which everything lives. Sejourne makes a strong case that the system of thought to which these profound ideas belong had been present in the Valley of Mexico for an unknowable length of time, perhaps thousands of years, before it was first encountered by the Aztecs. 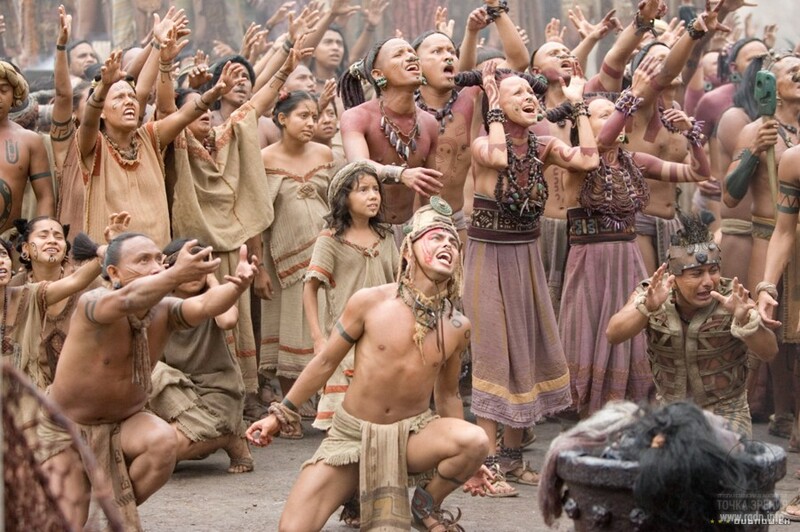 They were simply the most ferocious amongst a large group of migrant Nahuatl-speaking tribes known as the Chichimeca (a word that signifies ‘barbarians’), who poured into Central America from the north in the twelfth and thirteenth centuries AD. Having no culture of their own, they set about appropriating the fading remnants of the once-great Mexican civilization that they had overwhelmed, learning its astronomy, its agriculture, its engineering and its architecture, and acquiring aspects of its religious paraphernalia. They were particularly transfixed by its colourful and dramatic initiation rituals which they co-opted wholesale. Tragically, however, they did not understand – or did not want to understand – that the rituals were metaphorical dramas that were only intended to be played out symbolically. They took them literally, with horrific consequences. The Aztecs believed that their tribe had been born from womb-like caves in the heart of a mountain, that Aztlan, their first homeland, had been established on an island, and that they had been ordered to leave this island by their god Huitzilpochtli, who had prophesied: ‘The four corners of the world shall ye conquer, win and subject to yourselves… it shall cost you sweat, work and pure blood.’ (Apparently, the work with one’s four Aspects is meant here, the taming of the aspects, which is otherwise called ‘chaining up one’s animal nature’ or ‘killing the dragon inside oneself’). Like the Nazis mesmerized by Hitler, the Aztecs set about fulfilling the vision of Huitzilpochtli, easily overrunning the incumbent peoples of the Valley of Mexico and using war systematically to weaken and subjugate the other Chichemec tribes. In the early fourteenth century, in the swaps of Lake Texcoco, a rock was seen from which sprouted a cactus with an eagle perched amongst its thorns. 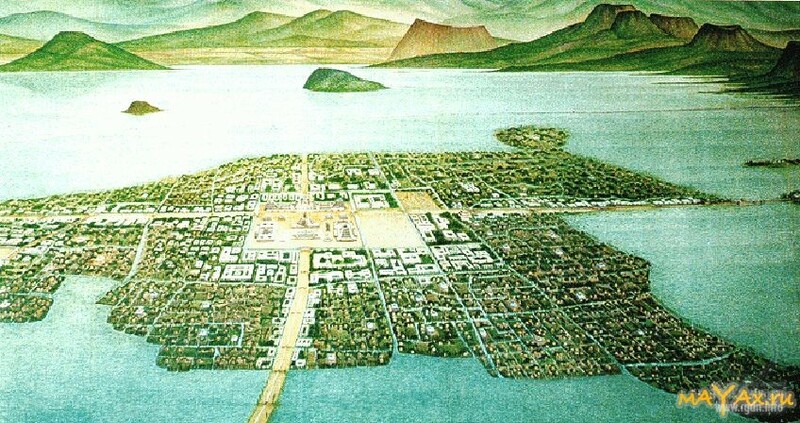 The prophecy was remembered and work was begun on the city of Tenochtitlan, which became the Aztec capital in AD 1325. 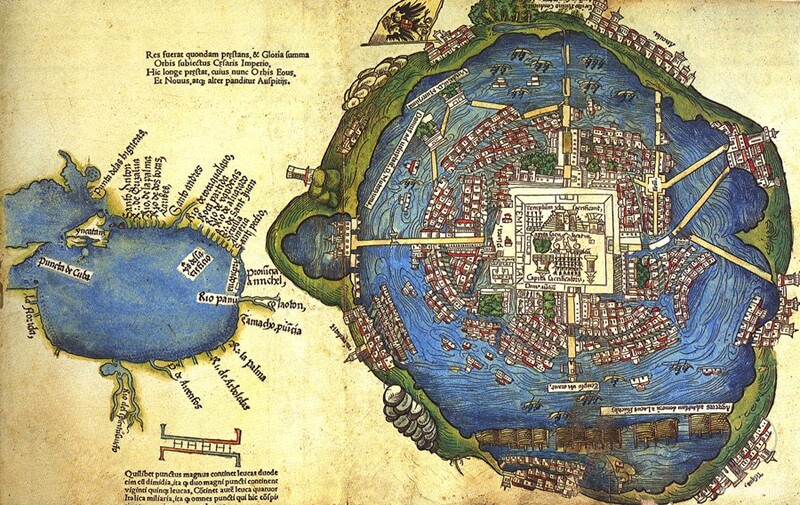 In the two centuries that remained until the Conquest, the Aztec empire centred on Tenochtitlan continued to expand its power and the city itself grew correspondingly in size to become a great metropolis of 300,000 people. Built on an artificial island, surrounded by a series of square and circular canals, it was oriented to the cardinal directions with masterfully engineered causeways running across the waters into its four principal entrance gates. The central plaza was dominated by a gigantic four-tiered step-pyramid, which the Spanish, who greatly admired its architecture, called the Templo Mayor. Cortés asserted that ‘no human tongue could describe its size and characteristics’, while Bernal Diaz reported: ‘there were soldiers that had been in many parts of the world, in Constantinople and in all Italy and Rome, and they said they had never seen a plaza so well proportioned and so orderly, and of such a size and so full of people’. 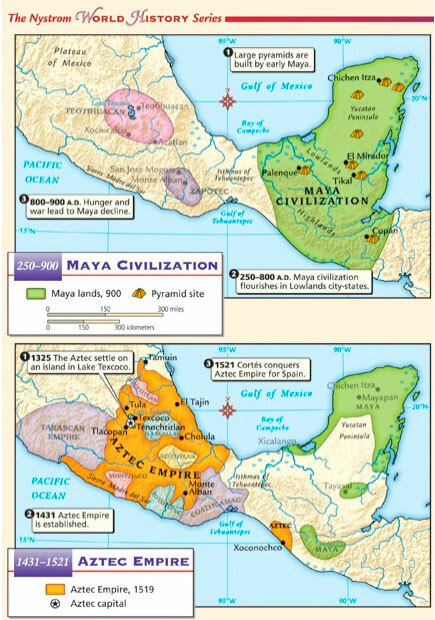 What is particularly notable is that the Aztecs did not take credit for the high level of civilization attested to by these and many of the other wonders of their blooming empire. Instead they frankly admitted that their entire system of knowledge had come to them in one piece, as a legacy, from the god-king Quetzalcoatl and his companions, those who were ‘the first inhabitants of this land, and the first that came to these parts called the land of Mexico… those who first sowed the human seed in this country’. In September 1996, a few days before the autumn equinox, we climbed the mountain known as Cerro Gordo and looked down from its summit over Teotihuacan, a Nahuatl name given to the city by the Aztecs and meaning literally ‘the place where men became gods’. 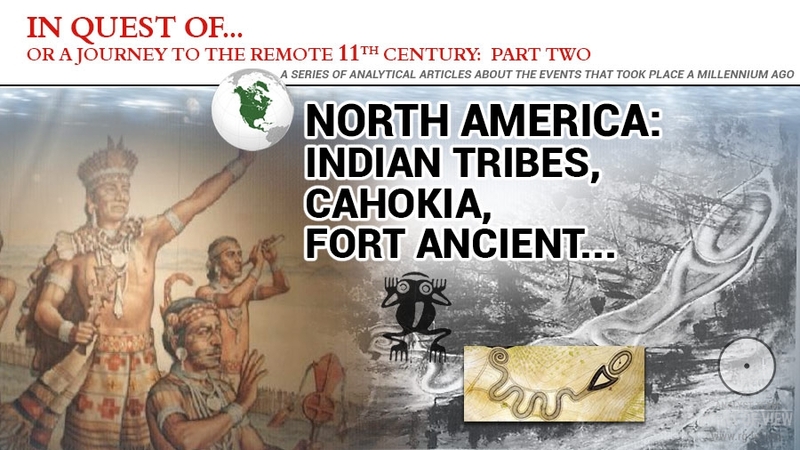 Stretched out below us was the arrow-straight axis of the so-called ‘Way of the Dead’, which runs 15 degrees and 30 minutes east of true north and west of true south. 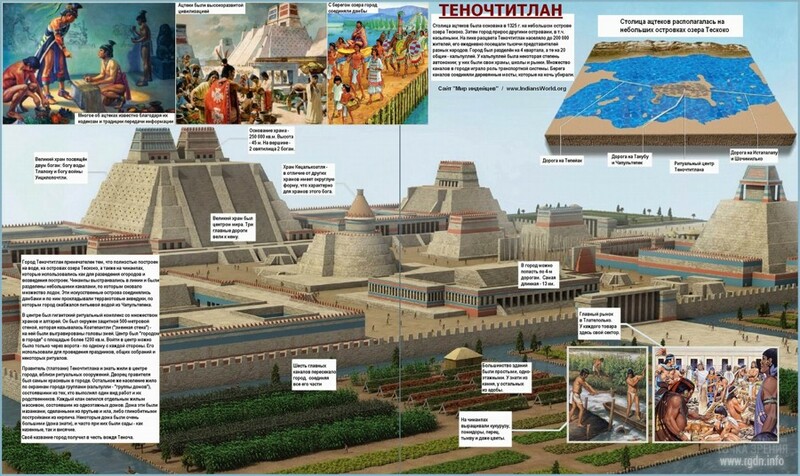 At its northern extremity, towering 46 metres high, we could see the five-tiered hulk of the Pyramid of the Moon. 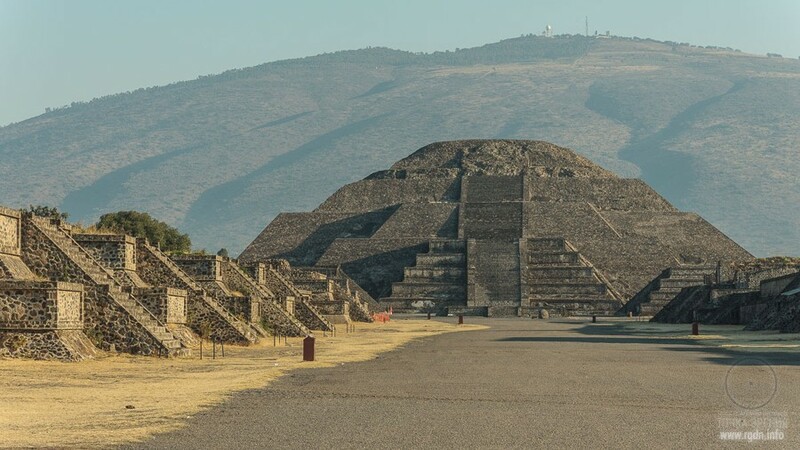 A kilometre to the south of it, on the east side of the Way of the Dead, lay the more massive Pyramid of the Sun, more than 70 metres high and measuring 222 metres along each of its four sides. Beyond that, set back within a spacious rectangular enclosure, was the smaller Pyramid of Quetzalcoatl. 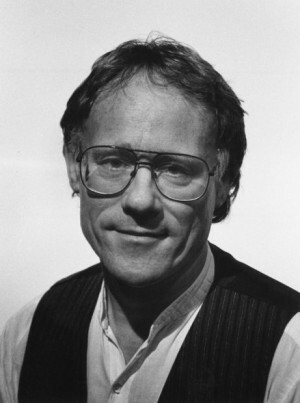 Professor Michael D. Coe of Yale University has pointed out that the Pyramid of the Moon and Pyramid of the Sun are both ‘explicitly named in old legends’ and concludes: ‘there is no reason to doubt that they were dedicated to those divinities’. The same names were adopted by the Aztecs when they stumbled upon Teotihuacan soon after they had begun to infiltrate the Valley of Mexico in the twelfth century AD. The gigantic geometrical city, already remotely ancient, had by then fallen into ruins. Nevertheless, the newcomers preserved distinct traditions concerning it, suggesting either that its reputation may have reached them before they migrated from their former homeland or more likely that they had learned about it from peoples whom they conquered on their route to power. 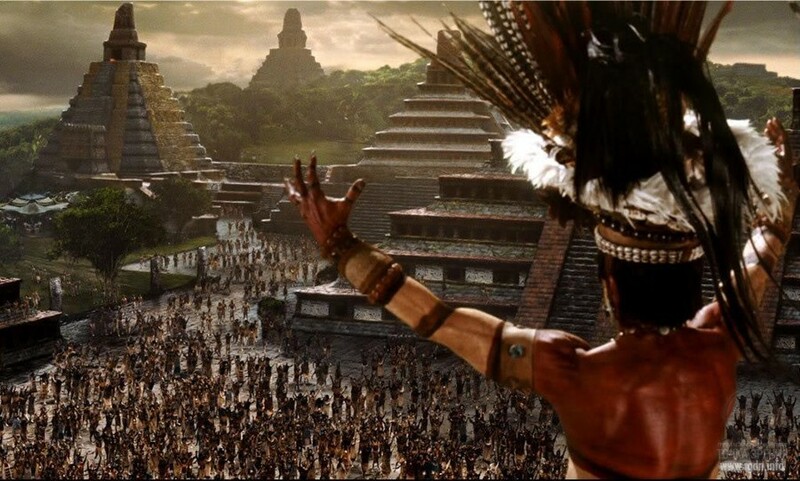 At any rate they respected it so highly that Montezuma, the Aztec emperor at the time of the Conquest, is reported to have made frequent pilgrimages on foot to the Pyramid of the Sun during the last years of his reign. 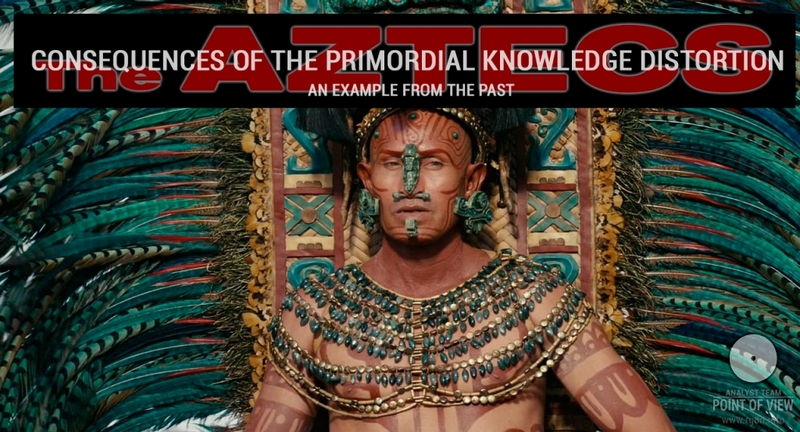 In common with all his subjects, Montezuma believed the pyramid to be the original primeval mound marking the spot where creation had been set in motion at the beginning of the present epoch of the earth. Traditions that were widely distributed throughout Central America, notable amongst unrelated neighbouring cultures such as the Maya, asserted that there had been four previous epochs, or ‘Suns’, each of which had ended in a cataclysm that had wiped the face of the earth clean. 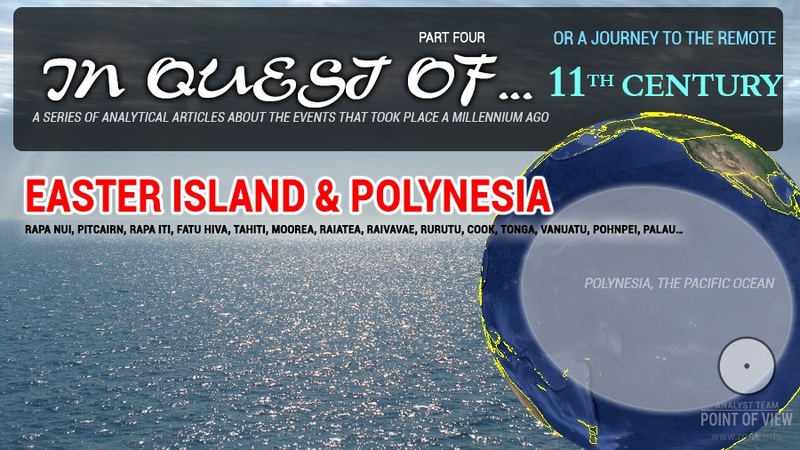 The fifth epoch was said to have begun in darkness on 4 Ahau 8 Cumku, a date in the Mayan calendar corresponding to 13 August 3111 BC, and was expected to come to a catastrophic end as a result of a ‘great movement of the earth’ on 4 Ahau 3 Kankin – which corresponds in the modern calendar to 23 December 2012. 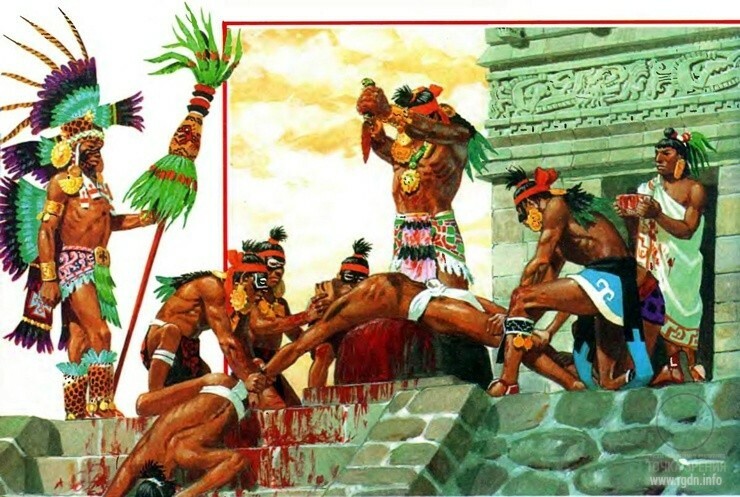 The Aztecs claimed that their motive for carrying out human sacrifices was to postpone, or if possible to prevent, the predicted end of the world – by offering up an endless supply of hearts and blood to ‘rejuvenate’ the aged Fifth Sun. When all things are considered, however, it seems most unlikely that they were ever sincere in this belief. As Sejourne argues, their repressive political system ‘was founded on a spiritual inheritance which it betrayed and transformed into a weapon of worldly power’. In other words they made gross material travesties of subtle symbolic rituals and exploited the old prophecy of the end of the Fifth Sun as a transcendent justification for the policies of terror that so many of them appear to have relished and that were used ‘to prop up their bloody state’. 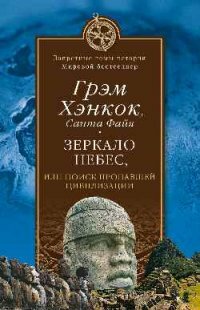 Let everyone make up their own conclusions, and in the commentary section we can exchange ideas of the ways to ensure preservation of the Primordial Knowledge in purity, and discuss whether we need to fight against those who deliberately distort the Knowledge or just ignore relevant facts.